Oral and Maxillofacial Radiology is logically organized, beginning with the basics of radiological diagnosis before discussing each of the advanced imaging modalities in turn. Modalities discussed include helical and cone-beam computed tomography, magnetic resonance imaging, positron emission tomography, and ultrasonography. Later chapters cover radiological pathologies of the jaw, and also those of the head and neck immediately outside the oral and maxillofacial region. 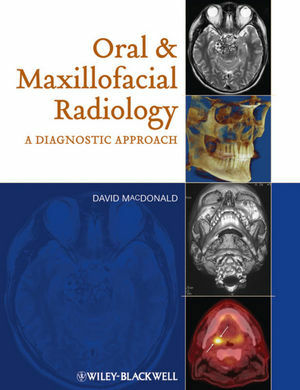 Written by a recognized expert in the field, Oral and Maxillofacial Radiology contains a multitude of clinical images, practical examples, and flowcharts to facilitate differential diagnosis. David MacDonald, BDS, BSc(Hons. ), LLB(Hons. ), MSc, DDS(Edin. ), DDRRCR, FDSRCPS, FRCD(C) is Associate Professor and Chairman of the Division of Oral & Maxillofacial Radiology at the University of British Columbia. He has held previous appointments at the universities of Edinburgh, Bergen, and Hong Kong and has published extensive on topics of the radiological aspects of the epidemiology of disease affecting the face and jaws. These publications include a wide range of lesions affecting the face and jaws of the hitherto underdocumented Hong Kong Chinese, an important world community, representing a large part of the Chinese diaspora.